Neighborhood Watch is a crime prevention program which enlists to active participation of residents in cooperation with law enforcement to reduce crime in their communities. Residents trained to recognize and report suspicious activities in their neighborhood. Implementation of crime prevention techniques, such as home security. Neighbors looking out for each other! A motivated individual, a few concerned residents, a community organization, can spearhead the efforts to establish a Watch. Select a coordinator or Block Captain who will be responsible for relaying information to the other members. Create a block group message/chat to ask questions, relay information, etc. 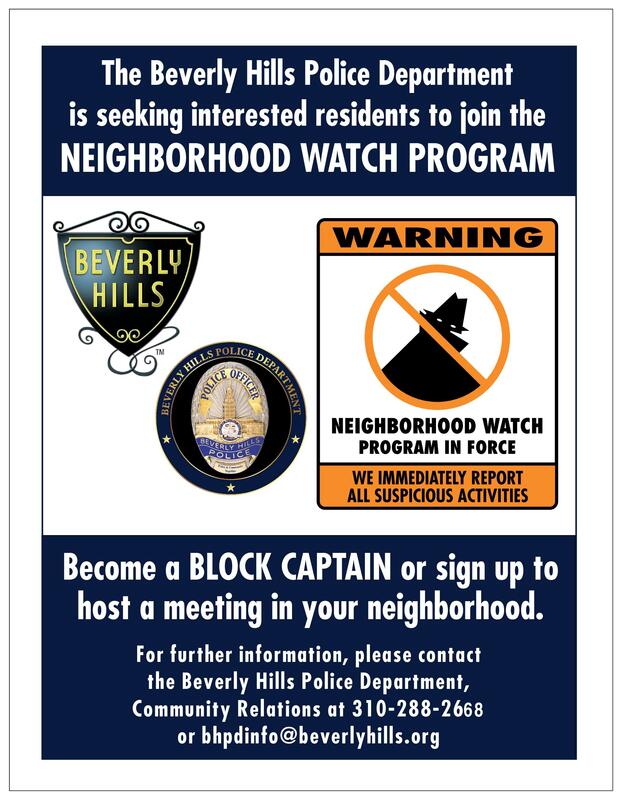 If you would like to request BHPD Police Officers to attend your next Neighborhood Watch meeting (to answer questions and address concerns), please contact the Community Relations Sergeant at 310-288-2668.